A child’s social and educational experiences are always a topic of interest for their parents, and perhaps they’d like to know what things are like today. Regardless of the reason, a boilerplate question like “How was your day” is hardly the most engaging way of broaching the topic to your child. They could easily answer with a monosyllabic “Fine” every single time you ask, and be over and done with it. Rather than such a generic inquiry, we propose a couple of more interesting, engaging questions to ask your child when they come home from school, that may get them talking more openly about their daily experiences. This kind of question is always a great way to start a conversation, as a child will naturally be inclined to go on at length about a topic that interested them. In some ways, it’s similar to how you can get a shy person to feel more open around you – getting them to talk about themselves or what interests them is a great opener. If you got to be the teacher tomorrow, what would you do, or teach the class? Aside from being a fun question that may spark some creativity, it may reveal further insight into any answers related to question #1. What nice thing did you do for someone today? The answer to this question may provide an opportunity to reward your child for kindness. Would you like to learn more about math, reading, writing or science in school? Asking this may reveal certain aptitudes or preferences that you can guide your child towards. Was there something you didn’t like about the day? By showing that you’re willing to listen to your child’s “rants” or frustrations about any experiences, you can help establish trust with them and make them more willing to come to you when they have problems. (Language) Which book/story did you teacher read in class today? Discussing the literature that your child has read provides further learning opportunities at home, outside the classroom. (Math) Were you able to use the counters in math today or did you use the dice? Math is a unique topic of discussion and you’ll be able to help your child understand certain concepts if you know about what was tackled in class. 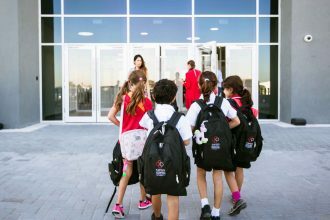 Aside from asking these questions, you may also read Swiss International School Dubai’s weekly newsletter, which shows the various activities and learnings that your children can look forward to in the following week.